The Grace Tarot Bag is adorned with lavender vines that gracefully branch and scroll across a deep purple background. The vines that coil and twine all over this bag represent regeneration and spirituality in both Pagan and Christian traditions. Lavender represents elegance, refinement and grace. Purple is the color of royalty and dignity but is also the color of the crown chakra, connecting one to the infinite. 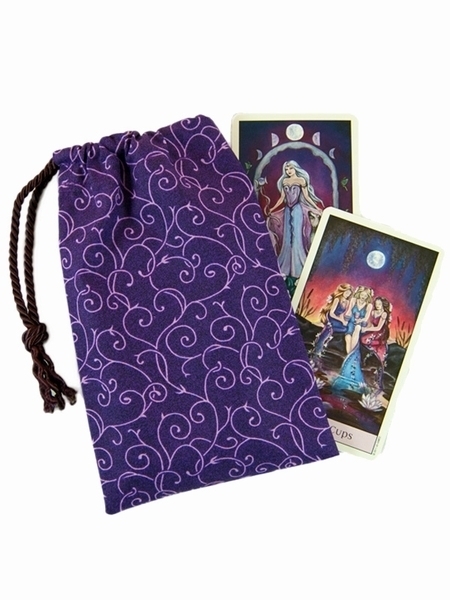 Deck Suggestions: Shown in the product image is the Grace Tarot Bag with Aubergine cord, accompanied with cards from the Crystal Visions Tarot deck (cards not included). Among the other tarot decks that this bag complements are the Shadowscapes Tarot and the Connolly Tarot.